Children's farm animals really brings the farm to life, creating the wonderful sights and sounds of a farm scene. Farmyard animals include cows, pigs and sheep with chickens, bulls, goats, donkeys and horses to replicate a real life farmyard scenario. A child's toy cow comes in all breeds and so does pigs, sheep, donkeys, poultry and even the farm dog. The toy farm animals we feature are all made from durable plastic and hand painted to the finest detail. The Bullyland and Schleich range are beautifully reproduced and come in 1:32 to big sizes. You can also create an instant farm with farm animal sets or play safe with wooden farm animals made from natural wood. Kids favourites, toy cows are a vital animal to have on the child's farm. They produce milk for dairy farms or used for meat. Browse from black and white cows to traditional Jersey cows. Browse sheep by Britains and Schleich for the child's farm fields and farmyard. Toy sheep are used for there milk, meat, and of course fur. You can buy plastic toy sheep in all scales. Children's farms won't be complete without one of the most popular farm animals today, large pink and saddlebacks. Toy pigs are perfect for keeping in pig sties as well as roaming freely. Bulls are used to breed with cows to produce calves to increase your livestock for milk and meat. Bulls come in all breeds from the biggest of all bulls, the Hereford bull, to the Simmental cattle. Raise chickens in the coop or big poultry shed for meat or eggs. But you'll need a few hens, along with a cockerel with a few chicks running around. 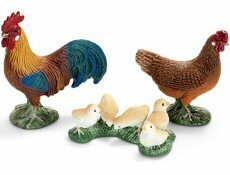 Schleich, Papo and Collecta all make toy chickens. Attract visitors and kids to your farm with a family of donkeys housed in a stable or barn. 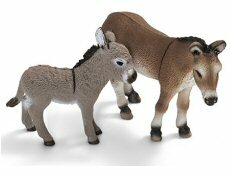 Toy donkeys come in big sizes and available in different breeds by Schleich, Bullyland, Collecta and papo - all made in plastic. Place a mix of poultry on the farm featuring anything from ducks to geese for meat or eggs. The young farmer will need to feed his poultry and collect eggs for breakfast or selling at the local market. With toy goats they can be used just like sheep to produce milk, cheese and other dairy products. Create pens or let them roam the farm creating an authentic farmyard scene. As an addition to farm animals we provide you toy dogs, cats and donkey's as well as wildlife animals to create the best looking child's farmyard scene. Populate your child's farm set quickly with a set of traditional farm animals. You can expect to find a cow, sheep, chicken, some poultry, a dog, and of course a horse for the stable. Traditional wooden toy farm animals make lovely gifts. Made to highest quality, wooden toy farm animals are perfect with children's handmade wooden toy farms.